"You get five waves every 40 seconds and you can catch up to 30 waves in an hour." EDMONTON - Attention, shoppers — surf's up. Already one of Alberta's biggest tourism draws, the consumer mecca of West Edmonton Mall is also becoming an unlikely magnet for surfers. "It's just surreal," says Jono Kusyanto, a lifeguard at the mall's water park who now doubles as Big Kahuna of its surf club. "You come into this tropical dome and you can surf. It's like real surfing. "My friend Kris says, 'I woke this morning, I brushed all the snow off my car and I went for a surf session.'" 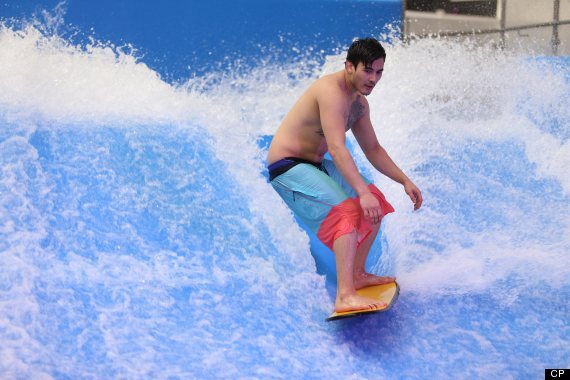 Four times a week, the mall's wave pool — the biggest indoor wave pool in the world, say officials — is given over to surfboard lessons or surf bros hangin' out and hangin' 10. Some ride the newly installed Tsunami, where pumps drive thousands of litres of water up and over a vinyl ramp at 50 kilometres an hour. The continuous sheet wave that results lets riders carve in, spin around and work on tricks. "It's like a combination of all the board sports — surfing, snowboarding, skateboarding — all combined into one," says Kusyanto, a 23-year-old Edmonton native who started surfing at age 10 under the tutelage of his Balinese father. It all started, he says, during training sessions for the water park's lifeguard staff. Because of the pool's artificially generated waves, surf rescue skills are part of the requirements. "We started playing in the pool and I said, 'OK, we'll turn the waves on and train with the waves on,' and from there we started having a little bit of fun," says Kusyanto. "We had these rescue paddleboards and they're very, very similar to surfboards. So we started surfing in the wave pool with them and you could get a real ride. It's very, very similar to surfing." The mall decided to open the experience to the public. It hasn't been widely advertised, but Kusyanto says the West Edmonton Mall surf club now has about 200 members and it's not unusual to see 25 surfers catching waves on a Thursday night. Yes, Kusyanto says, he does get a few raised eyebrows when he describes his home break to other surfers he meets on ocean-front holidays. "No one believes me," he says with a laugh. "You tell anyone from New Zealand and Australia and they'll laugh. They think it's a joke." But in some ways, it's better than the real thing — especially for beginners. There's no coral, no sharks, no jellyfish and no attitude from hostile locals unwilling to share a favourite break. The waves come in smooth, predictable and often. "You get five waves every 40 seconds and you can catch up to 30 waves in an hour," Kusyanto says. "You're lucky to catch three waves in an hour on an ocean." The word is creeping out. West Edmonton Mall draws 600,000 visitors a year from all over the world, and some of them are now coming specifically to ride flowboards on Canada's largest Tsunami. "It's almost like a flow culture out there and they know where all the new locations are that are being built," says Kusyanto. "We had people calling for months — 'When's it open?'" Kids as young as seven or eight can ride, as long as they meet the 107-centimetre height requirement. People catch on quickly. "It looks a little daunting at first," Kusyanto says. "But the learning curve is very fast, and usually within an hour you're standing up and riding pretty proficiently. "We're building an indoor surf culture in Edmonton." For more information, visit www.wem.ca.